These days, fireplaces are considered to be an essential element of a room. When you are going for a warm and cozy feel for your home or business, SoCal Fireplace mantels has rustic fireplace mantels that suit your needs. The goal of a rustic fireplace mantel is to accentuate the warm glow of the fire rather than to draw the eye to the mantel with excessive decorations. The characteristics that most rustic fireplace mantels have in common are a primitive look that has subtle detail or ornamentation, or no decorations or carvings. SoCal Fireplace Mantels offers a variety of materials from which you can use to create your rustic fireplace mantel, including natural stone and cast stone designs. If you do not find a rustic fireplace mantel in a design or material that you like, we can create a custom design just for you. Our skilled design representatives will even come to your home or business to view your furnishings and the design of the home, and take measurements and speak with you about your design options. 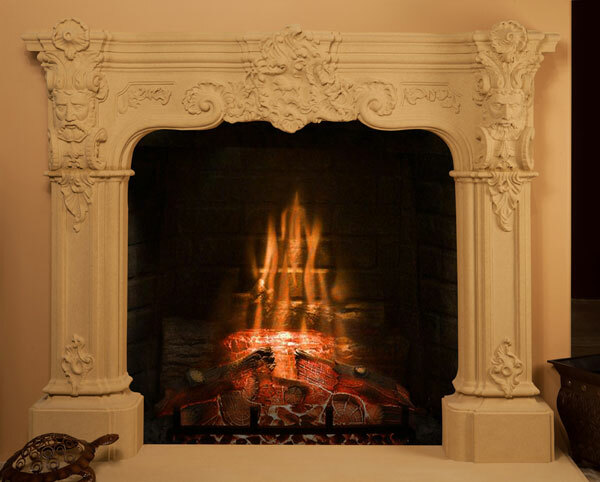 SoCal Fireplace Mantels is your premiere rustic fireplace mantel designer and provider. We have many rustic designs that accentuate the warm, comfortable atmosphere of any home or business. Stop by our showroom in Van Nuys to view our rustic fireplace surrounds for yourself, or call to request a catalog. Our knowledgeable representatives are pleased to answer any questions that you may have and to help you choose or design the perfect rustic fireplace surround.